Access Profiles, Inc.: Privacy and Background Checks - A Balancing Act! Some believe that by requesting a background check, employers are invading their privacy. Others believe that companies have the right and the responsibility to verify any information provided by the candidate. In fact, it is their legal obligation to provide a safe environment for their workforce, customers and the public. is both possible and desirable. First off, there are valid reasons why a company would use Background Checks as part of their hiring process. (Read "4 Reasons Why Small Businesses Need to Use Background Checks" here). 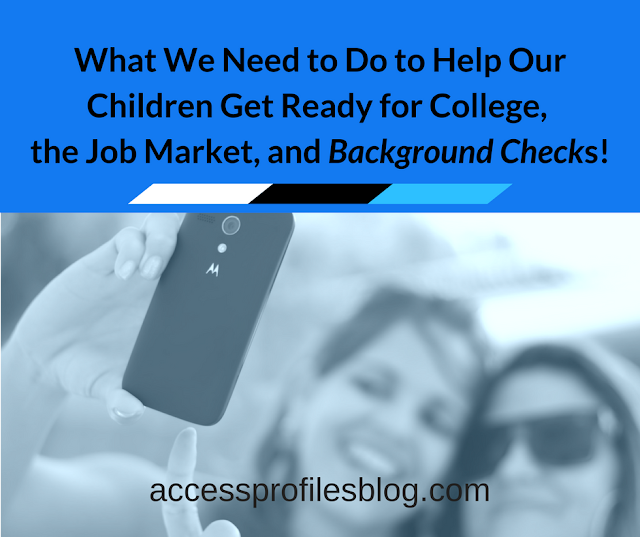 Background checks provide employers with a powerful tool. Their purpose is to help a company make a safe hire. They can also indicate the truthfulness of a candidate. The reality is that a person’s past does matter. Your past, both good and bad, shapes your character. Whether that past includes a criminal record or not, your past experiences mold you into the person you are today. Employers have a right to be reluctant to hire someone with a criminal history. Companies are responsible for ensuring a safe work environment for their other employees. They are obligated to craft policy to guard against violence and bullying in the workplace. Companies also face legal ramifications for unsafe hires. There are also positions where a person with a criminal past poses a specific threat. Someone with a history of embezzlement, for example, would most certainly be unsuitable to have access to company funds. The same would go for someone with a past drug problem having access to medications. In cases like these, an employer needs to know the past of their applicants. However, a criminal record should not automatically disqualify someone from employment. I truly believe in second chances and the need for everyone to find employment in order to make their way in this world. That is why it is important to weigh the past offense against the applicant’s ability to safely perform the duties required. Discover more of my thoughts on this in "Once a Criminal, Always a Criminal ~ Why We Need to Believe in Second Chances"! My motto: "Trust but Verify"! A Background Check can also be used as an indicator of a person’s honesty. Many employers request one to verify the education and past employment history of their applicants. Knowing that the information listed on a person’s resume is truthful is crucial. It is also important to know whether the skills listed, either as part of a degree or training, are valid. Hiring someone with a fabricated or exaggerated skill set is unfair and possibly dangerous for any company. Now comes the question of privacy. By its very definition, a Background Check concerns a person’s privacy. Any research into someone’s history delves into “private” matters. 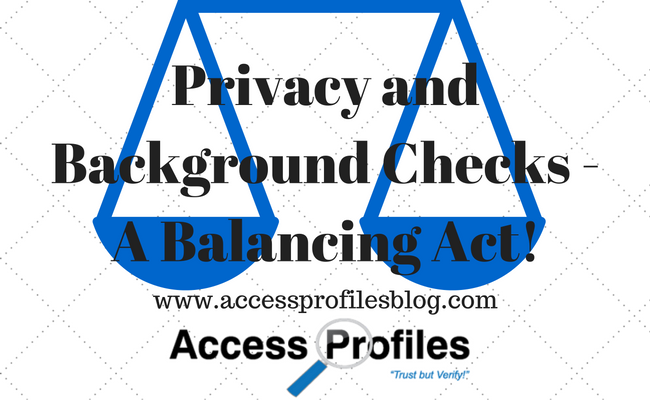 A Background Check is Not a Violation of Privacy! "Tweet This"
When a Background Check is conducted legally, an employer fully discloses that an investigation into an applicant’s past will be done and a release form permitting the investigation is signed. The release and the disclosure statement, by law, must be completely separate from a company’s application. 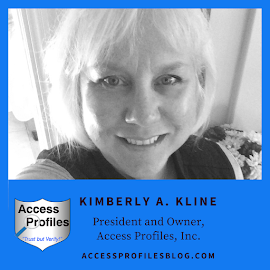 This ensures that the applicant fully understands that they are waiving their right to privacy in regard to the company’s Background Check process. and takes the issue of privacy into account. The key to balancing an employer’s right to know and an individual’s right to privacy is consistency and restraint. A company needs to be consistent in how they conduct their background checks and practice restraint as to what information they really require. They need to draft policy that indicates how much information is actually needed to ensure a qualified and safe hire and stick to those parameters for every candidate. In this way both the company’s rights and the individual’s rights are taken into account. Practicing true balance between the two goes a long way towards making the entire process as fair as possible - and that is a goal we should all try to achieve.